Among the world of video formats, why MKV becomes so popular? MKV is such a container that includes multiple subtitles and audio streams, and saves chapter info same as original BD\DVD Disc; meanwhile MKV contains a ton of extra features, it supports high quality H.264 video and it is open source. Besides all these advantages of MKV, it has one downside that MKV isn’t supported by certain devices and media player programs such as Microsoft’s Windows Media Player or Windows Media Center. So, if you are putting MKV videos in Windows Media Player, you need download and install certain MKV codec that to enable Windows Media Player play MKV. Just do a bit Google search and Shark007’s tools are regarded as top free codec packs for Windows Media Player and Windows Media Center. To start the whole process of enabling Windows Media Player to play MKV videos, you’d better to create a HD MKV file first. Mine is a Lossless backup of commercial Blu-ray Disc (created by Pavtube ByteCopy). You could make a lossless backup of your Blu-ray\DVD Disc and see how it works by following my below steps. Don’t forget to download a free copy of ByteCopy first. Now let’s take a look at how to make Windows Media Player play MKV files with the help of Shark007. Step 1. 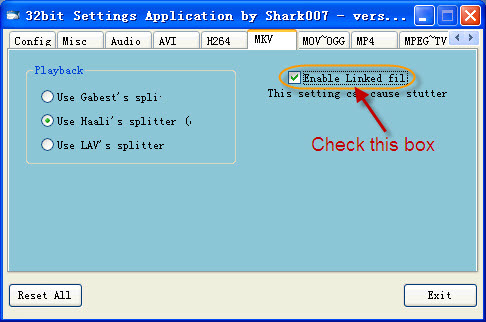 Download the Shark007 codec pack from above link, and double click the downloaded file to install the codec to your Windows Vista/XP. The Shark007 setup for Windows Vista/XP shows as a “VistaCodecs_v653.exe” file. Step 2. Launch the Shark007 v653 for Windows Vista and XP. Step 3. Press the “MKV” tab, and check the box of “Enable Linked files”. In that case the Shark007 will assist Windows Media Player with decoding/playing MKV files. Now MKV videos can be played in Windows Media Player 9 on Windows Vista and Windows XP. You could play, stop, fast forward/backward, or switch between subtitles and audio tracks the copied MKV files from original Blu-ray Disc in WMP 9. Tip 1: How to switch subtitles and audio language in Windows Media Player: Find a small icon of Haali’s splitter at the bottom right corner on your desktop, and right click to select subtitles and audio language for playback. Step 1. Download the Shark007 codec pack from above link, and double click to install the codec to your Windows 7/8. The Shark007 setup for Windows 7/8 shows as a “32bit_Advanced_v420.exe” file. Step 2. Launch the Shark007 v420 pack for Windows 7/8. Step 3. Press “MKV” tab, and check the box of “Enable Linked files”. In that case the Shark007 will assist Windows Media Player with decoding/playing MKV files. Now you arte able to play MKV videos in Windows Media Player 11 on Win 7/8 and Win 8, any operation like play, stop, fast forward/backward, switch between subtitles and audio tracks are available. Find a small icon of Shark007 at the bottom right corner on your desktop, and right click to set subtitles and audio language. Tip 3: How to lossless back Blu-ray Disc to MKV with multiple audio tracks and subtitle stream. Tip 4: Also refer to simple solution for getting Windows Media Center play MKV movie.